STARBUCKS, it was reported this week, is considering introducing electronic displays so customers can play Angry Birds, the world’s most popular mobile game, while they sip their macchiato. Perhaps this tells us something about the evolution of social mores. Recently enough it was bad manners to use a mobile phone in a cafe; now you can use your mobile to fire birds out of a slingshot at enemy pigs, while the other patrons in the cafe look on and maybe even, on the happiest of days, applaud. Angry Birds has been downloaded some 350 million times, so this is probably just a simple matter of majority rule. Even British prime minister David Cameron is reportedly a fan of Angry Birds, which will be a comfort to those who look to the Bullingdon club for guidance on proper behaviour in polite society. It’s funny, then, the way having an interest in actual birds is still so very uncool. It’s that time of year again, when the birdwatchers arrive in south-west Clare. You forget all about them from one autumn to the next. Then one morning you wake up and ten men in nylon jackets are leaning over your garden wall, looking through binoculars and pretending they can’t see you. This is a place so windy that what few trees we have are all reaching longingly toward the more temperate east. Nevertheless we have birds which, like proper locals, we don’t appreciate. For many of us, there are really only three species of bird – ones that look like crows, ones that look like seagulls and ones that look like sparrows. The latter group includes robins; everyone knows robins. “Oh look, there’s a kittiwake,” say friends who come to visit. “What? Where? Oh, you mean that seagull thing?” we reply. One year a Canada Warbler got blown off course and ended up here by mistake, and apparently this is no place for a Canada Warbler. Bird-watchers flocked from all over the world to see it. This was an event so momentous in bird-watching circles that it even brought about a relaxation of the stringent rules governing birdwatcher/non-birdwatcher interaction. Customarily, when they see you coming, birdwatchers fly away, or attempt to make themselves invisible in the hedgerows, but the beatific presence of a stranded yellow bird led to a social breakthrough. They actually let us look through their binoculars. There it was, a tiny yellow body sitting motionless on a low branch. The excitement was palpable. “Wilsonia Canadensis, you say? My word, how interesting.” The birdwatchers preened, visibly pleased at having impressed us. A new mutual regard became a possibility. Maybe this birdwatching lark had something going for it after all. Better go home and lock the cats up. 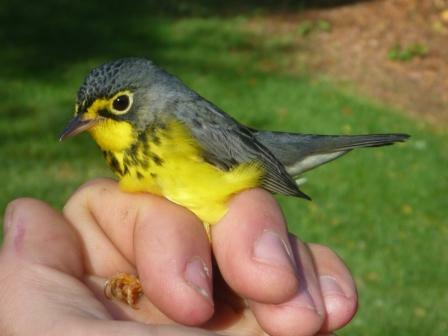 Then it emerged that nobody had a rescue operation in mind – nobody, not even the birdwatchers who had flown in from Canada, and so, you would think, might have been in a position to give a doomed Canada Warbler a lift home. Birdwatchers don’t interfere; nature has to have its way; the bird must die; they simply observe it in its last wretched hours and write what they see into their wretched notebooks. It is at moments like those that you realise you will never be a birdwatcher. You can, however, become a birdwatcher-watcher. Why do they all have the same plumage? Is there a shop that specialises in navy rainproof clothing for birdwatchers? Except that one there, look – do you think that high-vis vest is an attempt to attract a mate? Shh, don’t laugh, you’ll startle them. Why are so few of them handsome? Is that why the handsome ones stand out so much? Why do none of them have young? Come to think of it, where are all the females? Sometimes the bird-watchers arrive in such great numbers that the experience calls to mind wading through the pigeons on St Mark’s Square. Only by clapping your hands sharply can you get them to move out of the way. To their credit, though, it must be said of them that they leave very few droppings. At night, tired and thirsty, they make their way in V formation to the local cafe bar, where they sit for two-and-a-half hours with one half-pint of Guinness, thereby subverting years of carefully-placed propaganda about the benefits of tourism to the rural economy. Meanwhile, back in the real economy, the man behind Angry Birds will fly into Ireland next month. Mikael Hed, chief executive of the game developer Rovio, is attending the Dublin Web Summit on 27 and 28 October, which may be of interest to people who follow the migratory patterns of tycoons. This could be a chance to pitch him the Angry Birds spin-off – Angry Birdwatchers.